Understanding how the convergence between chronic and complex diseases—such as cancer—and emerging conditions of older adults—such as frailty—takes place would help in halting the path that leads to disability in this age group. The objective of this manuscript is to describe the association between a past medical history of cancer and frailty in Mexican older adults. This is a nested in cohort case-control study of the Mexican Health and Aging Study. Frailty was categorized by developing a 55-item frailty index that was also used to define cases in two ways: incident frailty (incident >0.25 frailty index score) and worsening frailty (negative residuals from a regression between 2001 and 2012 frailty index scores). Exposition was defined as self-report of cancer between 2001 and 2012. Older adults with a cancer history were further divided into recently diagnosed (<10 years) and remotely diagnosed (>10 years from the initial diagnosis). Odds ratios were estimated by fitting a logistic regression adjusted for confounding variables. Out of a total of 8022 older adults with a mean age of 70.6 years, the prevalence of a past medical history of cancer was 3.6 % (n = 288). Among these participants, 45.1 % had been diagnosed with cancer more than 10 years previously. A higher risk of incident frailty compared to controls [odds ratio (OR) 1.53 (95 % confidence interval (CI) 1.04–2.26, p = 0.03); adjusted model OR 1.74 (95 % CI 1.15–2.61, p = 0.008)] was found in the group with a recent cancer diagnosis. Also, an inverse association between a remote cancer diagnosis and worsening frailty was found [OR = 0.56 (95 % CI 0.39–0.8), p = 0.002; adjusted model OR 0.61 (95 % CI 0.38–0.99, p = 0.046)]. Cancer is associated with a higher frailty index, with a potential relevant role of the time that has elapsed since the cancer diagnosis. Cancer survivors may be more likely to develop frailty or worsening of the health status at an older age. This relationship seems especially evident among individuals with a recent oncological diagnosis. 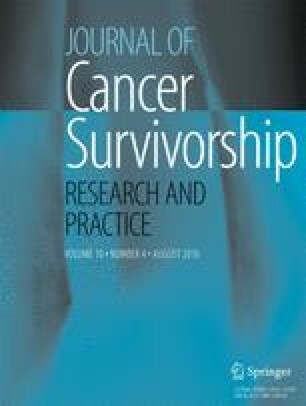 Health professionals in charge of older adult care should be aware of this association in order to improve outcomes of older adults who survived cancer. The online version of this article (doi: 10.1007/s11764-016-0519-6) contains supplementary material, which is available to authorized users. The Institutional Review Boards or Ethics Committees of the University of Texas Medical Branch in the United States, the Instituto Nacional de Estadística y Geografía, the Instituto Nacional de Salud Pública, and Instituto Nacional de Geriatría in Mexico approved the study. All study subjects signed an informed consent. Dr. Pérez-Zepeda received funding from diverse sources: Instituto Nacional de Geriatría, Universidad Nacional Autónoma de México, Gérontopôle, Centre Hospitalier Universitaire de Toulouse, and Université de Toulouse III Paul Sabatier. None of the funding entities had anything to do with any stage of the manuscript. Ferlay J, Soerjomataram I, Ervik M, Dikshit R, Eser S, Mathers C et al. Cancer incidence and mortality worldwide: IARC CancerBase No. 11. In: GLOBOCAN 2012. http://globocan.iarc.fr. 2012. Accessed 11/04/2015 2015.